Most of the media spotlight at the VMworld 2012 conference in San Francisco last week was squarely focused on VMware’s new CEO, or the new features in vSphere 5.1 and the vCloud Suite, or on the official reveal of the VMware Horizon suite. But one of the most promising new VMware projects in development was being demonstrated without fanfare in a tiny corner of the sprawling VMware expo hall. Called Project NEE (for Next-Generation Education Environment), this new project has the potential to revolutionize online learning. Project NEE is the brainchild of a group of VMware engineers who were determined to find a better way to conduct online training. They decided to incubate the project in a program at VMware — sponsored by the office of the CTO — that encourages employees to pursue projects that aren’t part of their traditional responsibilities. VMware engineers Curtis Pope and Mike DiPetrillo are the NEE project leads, while VMware engineers David Colwell and Simon Threasher contribute development effort towards the project as well. Project NEE is currently in closed beta. 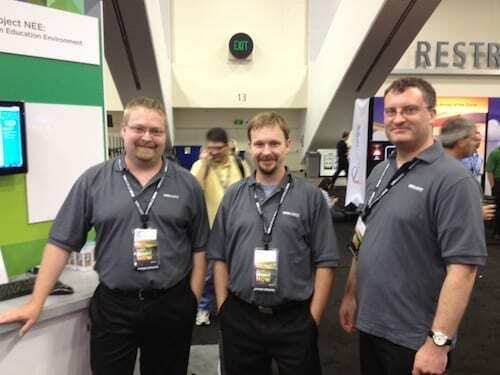 (From L to R): Project NEE developers Curtis Pope, David Colwell, and Simon Threasher. So what exactly is Project NEE? In a nutshell, it provides a radical new way for online training to be presented by instructors and utilized by students. Project NEE offers online labs, live chat, video, social media, and access to real virtual machines — delivered via the cloud — to enhance training. For example, a student trying to learn vSphere could log on to the Project NEE portal, access a VM containing his test environment, and run his virtual test environment and all of his supporting test materials via the cloud. I spoke with David Colwell about Project NEE on the VMworld show floor, and he explained some of the thinking behind the creation of project NEE. Colwell also explained that Project NEE is designed from the start to be extended with other learning features and options, including the ability for instructors to put a special agent inside of the training VMs that can verify that students did complete the tasks required for their training. The platform can also be equipped with support for live chat, so remote support people can help students easily navigate past any technical glitches or course questions that could hinder course completion. While Project NEE is currently available for testing by the public, you can find out more at the official Project NEE website. Are you interested in using Project NEE when it becomes available? Feel free to tell me what you think of Project NEE by adding a comment to this blog post or reach out to me on Twitter.